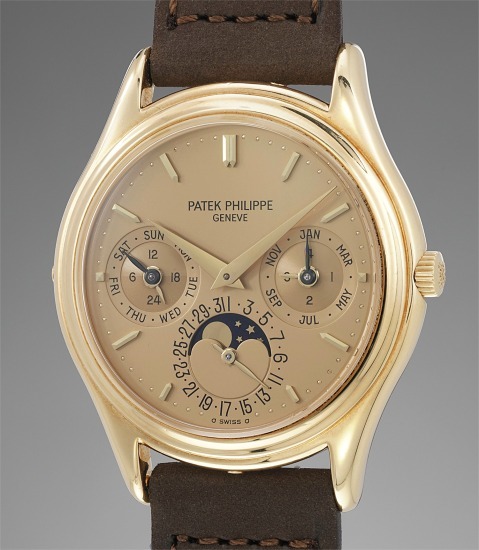 Reference 3940 is one of the most iconic models that Patek Philippe ever produced. Launched in 1985 under the tutelage of Mr. Philippe Stern, it marked a design shift for the manufacture's perpetual calendar models. No longer sharp and elongated, the case transformed into a tonneau-shaped Calatrava-style design. Most notably, the first 25 examples were specially made for the 225th anniversary of Chronométrie Beyer and displayed a champagne dial with the individual number at 6 o'clock. This beautiful first generation reference 3940 is very remarkable due to a number of reasons. It most notably displays a champagne dial, which is confirmed by the Extract from the Archives. Shimmering and finished with utmost care, this champagne dial is visually arresting. Mr. Stern himself donned a reference 3940 with champagne dial, attesting to the beauty of this exact model. The present watch is one of only five known first series examples to be fitted with the present dial. Interestingly, the Extract from the Archives mentions that the original solid caseback was replaced by a sapphire-crystal case back during a servicing in the Patek Philippe workshops in 1998. First generation reference 3940s were fitted with a solid caseback. It thus comes as no surprise that a loyal and privileged client of Patek Philippe would want an upgraded caseback to admire the beautifully-finished caliber 240Q. Such requests were only granted on a case by case basis, and it is not improbable that this wish was approved by Mr. Philippe Stern himself. This feature adds another level of desirability and exclusivity to the present timepiece. Since its founding in 1839, this famous Geneva-based firm has been surprising its clientele with superbly crafted timepieces fitted with watchmaking's most prestigious complications. Traditional and conservative designs are found across Patek Philippe's watches made throughout their history — the utmost in understated elegance. Well-known for the Graves Supercomplication — a highly complicated pocket watch that was the world’s most complicated watch for 50 years — this family-owned brand has earned a reputation of excellence around the world. Patek's complicated vintage watches hold the highest number of world records for results achieved at auction compared with any other brand. For collectors, key models include the reference 1518, the world's first serially produced perpetual calendar chronograph, and its successor, the reference 2499. Other famous models include perpetual calendars such as the ref. 1526, ref. 3448 and 3450, chronographs such as the reference 130, 530 and 1463, as well as reference 1436 and 1563 split seconds chronographs. Patek is also well-known for their classically styled, time-only "Calatrava" dress watches, and the "Nautilus," an iconic luxury sports watch first introduced in 1976 as the reference 3700 that is still in production today.